Do the containers have ventilation? Yes and No. Standard containers have built in roof ventilation while modular containers are more air tight. Your application and location will dictate how much ventilation you will need. Standard container vents can be restricted or closed off, while modular containers can have added vents, so no matter the style of container, ventilation can be adjusted to suit. How is a container constructed? A West storage container is constructed using 18 and 24 gauge, G90 galvanized steel and composite wood flooring. Assembled using clinch joints instead of spot welds for better corrosion resistance. And all panels bolt together to provide a weather tight seal. West storage containers are very secure. They come standard with a high security door bar lock and lever mechanism that is designed to accept any standard lock. Heavy-duty hinges and tamper proof hardware provides additional security. Can you put a container anywhere? 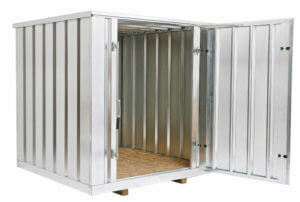 The West storage container is a flat-pack secure storage unit designed for use in virtually any location. The components are light enough to be carried by hand and small enough to fit through a standard man door. No need for cranes or special moving equipment. How long does it take to assemble the container? Because it is shipped in a knocked down form, the first time assembly is approximately 3 hours for a standard container, and 2 hours for a modular container. Required are two people. A third person would be occasionally helpful. After the initial assembly, any future assembly/disassembly would take about 3/4 hour. How weather proof are the containers? The container will keep your possessions dry in most situations. If the container is sitting in more than 6″ of water, it is possible for water to get in. Also, small amounts of blowing snow may get in around the door seal area. Modular containers are better at keeping out blowing snow. Extreme weather kits are available to prevent this from happening. Can I order a door for both ends of the container? Any standard or modular containers can have a rear door added. This is ideal for drive through applications (ATV or Snowmobile). Modular containers can also have a side door added. What is the weight capacity of the container? A forklift (with proper fork extensions) with up to 2000 lbs of contents (evenly distributed load) can move a standard container. We do not recommend moving larger containers (double deep or more) by forklift while loaded. The standard and modular doors are reversible. Simply mount the hinges and door bar lock on opposite sides. If you have any questions for our FAQ’s, please contact us at wsteel@weststeel. com. Or call us at 888-335-4507.